Marsh-marigold Caltha palustris is one of those wonderful wildflowers of early spring that offer hope of warmer weather to come after a long cold winter. 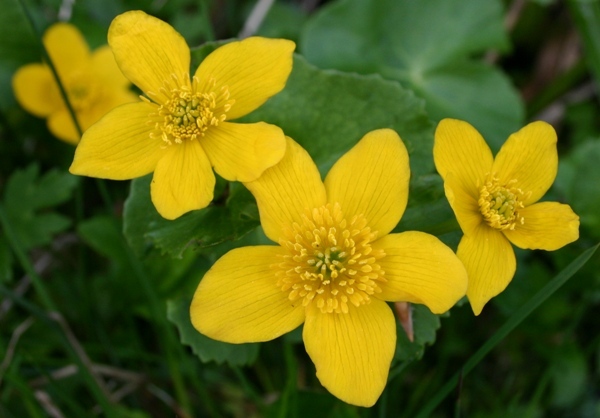 Between 2 and 5cm in diameter, most of the bright yellow flowers of Caltha palustris have five petal-like sepals (although sometimes you may see flowers with as few as four petals and very occasionally there can be up to nine) with numerous yellow stamens. The waxy green kidney-shaped or roundish leaves are 5 to 20cm across and have bluntly-serrated margins. 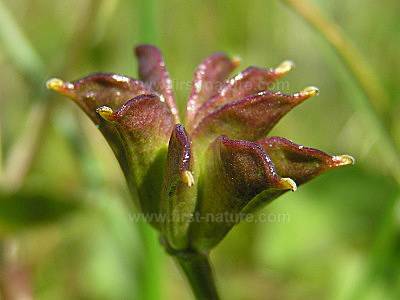 Another very helpful identifying feature is that the stems of Marsh-marigolds are hollow. Common and widespread throughout Britain and Ireland, Marsh-marigolds are found throughout mainland Europe, northern Asia and the cooler northern parts of North America. 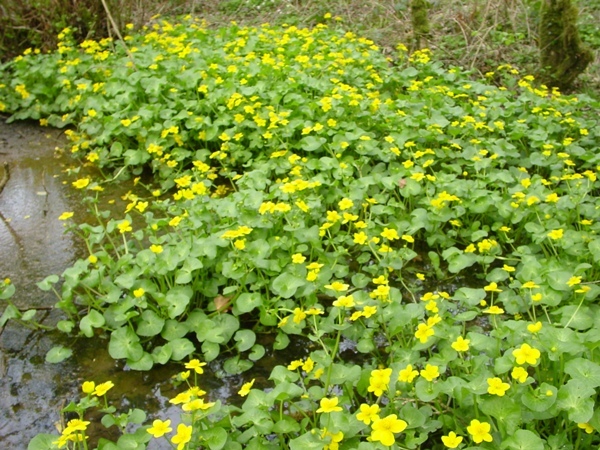 Found mainly in wet (carr) woodlands, river and stream margins, bogs, marshes, and the banks of lakes and ponds, the aptly named Marsh-marigold, alsoknown by many other local names including Kingcup and May Blobs, is a most conspicuous wildflower. These large butter-yellow flowers also light up the edges of shady woodland streams and damp ditches beside country lanes. In sheltered locations the first flowers of Caltha palustris can appear in late February well before the spring fireworks display of other wildflowers, but April and May are when you will see these flowers at their best in Britain. A few stragglers sometimes continue to bloom well into June or early July, but by then the plants have collapsed and lost their youthfulness. Roots, stems, leaves, flowers and seeds of this plant are all poisonous, and if handled they have been known to cause irritation of the skin and even dermatitis. Nevertheless, their value in the margins of a garden pond or any other shaded boggy hollow is not restricted to their aesthetic beauty: in common with other members of the Buttercup family, Marsh-marigolds are pollinated by the many small insects of springtime. Caltha, the generic name, means cup and is a reference top the cup-shaped flowers, while the specific epithet palustris means of marshes. Marigold is a corruption of 'Mary Gold' - a reference to the Virgin Mary. In this instance Marigold is something of a misnomer, because Marsh-marigolds are not closely related to other daisy-like marigolds of the family Asteraceae; however, gold is certainly a very good description of their colour. 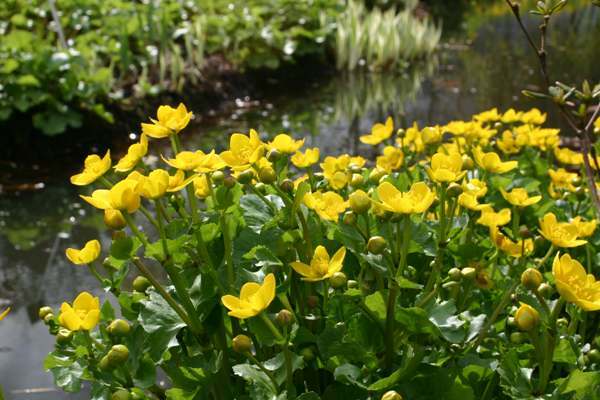 The English common name is sometimes written as Marsh Marigold rather than Marsh-marigold. Globeflower Trollius europaeus has equally large butter-yellow flowers but they do not generally open out fully as the flowers of Marsh-marigolds tend to do.